After two brutally cold winters, in 2014 and 2015, nearly half of the 82,000 trunks on the 55-acre Stratus Vineyards in Niagara-on-the-Lake were damaged. 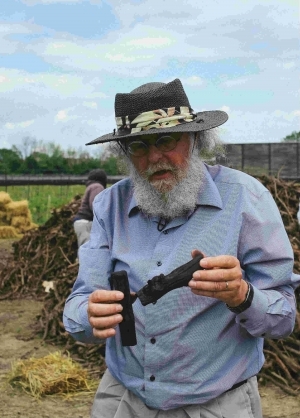 Most wineries would be happy to remove any reminder of such devastation, but winemaker J-L Groux and vineyard manager Dean Stoyka had an idea to conjure a phoenix from this tangled vine graveyard by turning it into biochar, a form of charcoal. Spurred on by reading studies showing biochar had a positive impact on soil, the pair were convinced they should try it in the vineyard. But even with more than 40 years of winemaking experience between them and degrees in winemaking and viticulture, they didn’t know where to start. Luckily, they already had expertise on their team. The biochar worked so well last year, Stratus produced more this year. The technique aerated the soil and held onto nutrients and water (which was especially helpful in a wet growing season) to turn around a block of Syrah that’s been one of the vineyard’s perennial weakest. He has the hard work of Reid and the vineyard’s team of Jamaican workers to thank for much of the improvement. 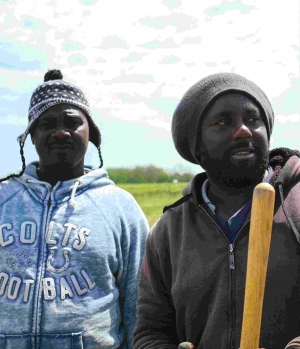 So do vineyard managers and fruit and vegetable growers all across Canada, who rely on tens of thousands of migrant workers like Reid from Jamaica, Mexico, the Caribbean and Southeast Asia. For each vintage, seasonal workers come over in the spring and stay until the autumn harvest. These workers come to Canada under the Seasonal Agricultural Worker Program or the Temporary Foreign Worker Program. They stay for up to eight months tending to the grapes, fruits and vegetables that fill our plates and wine glasses. The pay is hourly and the rate is generally provincial minimum wage. Employers must also provide workers return plane fare, as well as boarding and health insurance. Depending on the province, some of these costs can be recovered through pay deductions. To the average Canadian, the work may not seem glamorous or desirable. There are notable shortcomings like having your visa tied to one employer with no overtime pay or weekly hourly limit (like there would be under Canadian legislation). But the hook for the workers, who come mostly from rural areas of their home countries, is that these programs offer the opportunity to earn more money than they would back home. As a seasonal worker, they can provide themselves and their loved ones with a better life. He’s also acutely aware of how critical his work is to the winemaking process and he takes pride in his contribution. “We’ve got a lot of experience in the vineyard with all these professionals. We know everything. Without us on the farm there wouldn’t be good wine in the winery,” he says. Cave Spring Cellars’ vineyard manager Chris Andrewes appreciates the contribution of seasonal workers to his winery. Over the years, the wages he’s earned have gone into buying new tractors for his farm, renovating his home and supporting his family. While he likes the work, he is caught in the dilemma of being away from his family for long periods of time. But it’s been a bit less lonely since the team at Cave Spring helped to bring up both his son and son-in-law. They’re filling in for a colleague who didn’t return this spring after earning enough over the years to start a catering business in Mexico. One of the biggest shortcomings of the Seasonal Agricultural Worker Program and the Temporary Foreign Worker Program is that, aside from those who directly employ them, the efforts of the migrant workers remain largely anonymous. “We prize our athletes who can skate, or run, or throw fast or great distances, or have amazing endurance,” says Norman Hardie, of Norman Hardie Winery and Vineyard in Prince Edward County. It’s hard to argue with Hardie and Pavan’s assessments after witnessing the group of Thai workers Hardie employs, led by patriarch Sirichai Soisongchan. When we visited the vineyard, Soisongchan was squatting down to swiftly and effortlessly pluck just the right leaves transforming a row of Pinot Noir from untamed to immaculate. They had the rest of the 6,000 vines in the same shape in under 48 hours. Soisongchan is Hardie’s eyes, ears and mouth in the vineyard. “I trust him implicitly,” Hardie says, noting he relies on him to communicate instructions to junior members of the team, teach them the intricacies of the vineyard, and alert the winemaker of any potential problems. As one of the first Thai vineyard workers in Prince Edward County to come under the Temporary Foreign Worker Program, Soisongchan’s many years of experience are invaluable to the process. For Hardie and Soisongchan it’s a symbiotic relationship. Soisongchan says he likes working for Hardie, which is noticeable during our visit when he and some of the other workers take selfies and send excited video messages back home during a communal meal of stir-fried pork and rice. For their work and loyalty, Hardie also ensures his workers go home with a bonus at the end of the year as a token of his appreciation. But even in the heart of Ontario’s wine-growing communities there’s still a long way to go to build a greater appreciation of the workers outside the farms. Jane Andres, who owns a bed and breakfast in Niagara-on-the-Lake and organizes an annual welcome concert for Jamaican workers, has seen the physical impact of the programs on workers. But it’s often the psychological effects that have the worst unintended consequences, she suggests. Being away from family for up to three quarters of the year, putting in long, hard hours doing repetitive tasks with little down time, and not feeling like a full member of the community are pressures migrant workers face daily. “That’s the hardest thing. Nobody wants to know what they have to say. The feeling of powerlessness is really psychologically tough,” she says. She is encouraged by the work of the Southridge Community Church in Vineland whose leadership began an outreach program for Caribbean farm workers. They provide basic toiletry kits, work gloves and some non-perishable food to get them through the first few days after arrival. They’ve also established a free medical clinic at the church, and twice a month they host social visits.